Amethyst is used to: cure anxiety, treat hangovers, calm tooth aches, skeletal pain, posture and other bone, muscle and joint-related sicknesses (arthritis). Amethyst also cures digestive and stomach problems. It has also been known to treat various types of blood disease and sugar inbalances in the human body. 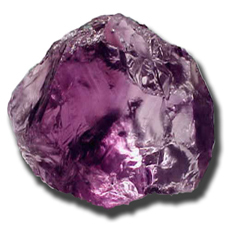 As a healing stone, Amethyst is used to treat and heal problems with the central nervous system, convulsions and neuralgia. It also has been used to improve stamina and insomnia. The Amethyst has been, for thousands of years, a stone of positivity. Radiation is a function of light and this means that light reaches an object without using the air. For example, the Sun's light reaches the Earth through space by radiation. The second function is the deep impact power. Different from ordinary light beams and short wave infrared rays, Long Wave Infrared Rays, or Far Infrared Rays, can penetrate deep inside our bodies. Because of this, it can warm our bodies from the inside out and stimulate many body systems. This third function can be explained by an example of touching a large bell with a single finger. A bell has an inherent number of vibrations when it is struck. When the bell is struck at a normal interval, it causes vibrations which causes it to move. When the energy used to activate the bell is stronger, the vibrations between molecules increases and the electronic energy grows. As a healing stone or crystal, Amethyst is used to treat and heal problems involving the central nervous system and is a treatment for both convulsions and neuralgia while containing sobering and calming qualities. This stone is commonly associated with peace. It soothes those who have engaged in constant rigorous mental activity. It has been deemed as "nature’s tranquilizer" by many healers because of its effectiveness in relaxing not only the mind, but also the nervous system. It is known for protecting the mind from psychic attacks and transforming negative energy into positive and tranquil tenacity. A recent study with the Biomat showed that it can reduce stress by 78%.